Based on the beautiful shores of the Gower Peninsula, Selwyn’s is a family-run seafood business. 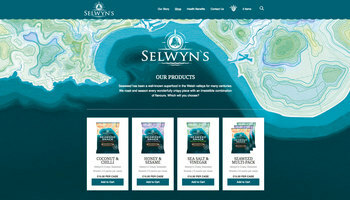 Selwyn’s were updating their brand image, and needed a new web presence to reflect their new identity, offering and to be able to sell online. Incorporating the new brand and product offering into a new site running on Shopify. After some lean research, I audited the existing website content, then moved on to creating a sitemap and wireframe prototypes to show the client. I then worked with the design team to create some beautiful designs that could be brought into Shopify’s templating system. A professional site with gorgeous design, rewritten content and a simple purchasing journey for customers.